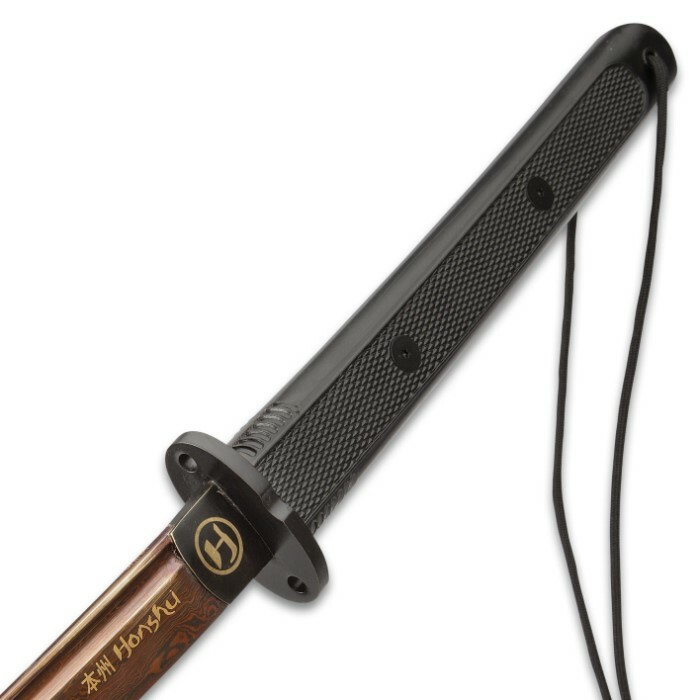 Honshu Evenfall Handmade Wakizashi / Samurai Sword - Exclusive Black Damascus Steel - Modern Tactical Ninja Style - ABS Handle, Textured Grip, Paracord Lanyard - Saya / Scabbard - Full Tang - 31 1/2"
Like chocolate, coffee or fine ebony, Honshu swords seem at their richest, boldest and most intense when they’re also at their darkest. Case in point: Honshu’s brooding “Evenfall” Wakizashi. This black beauty is an onyx jewel in Honshu’s cutlery crown. 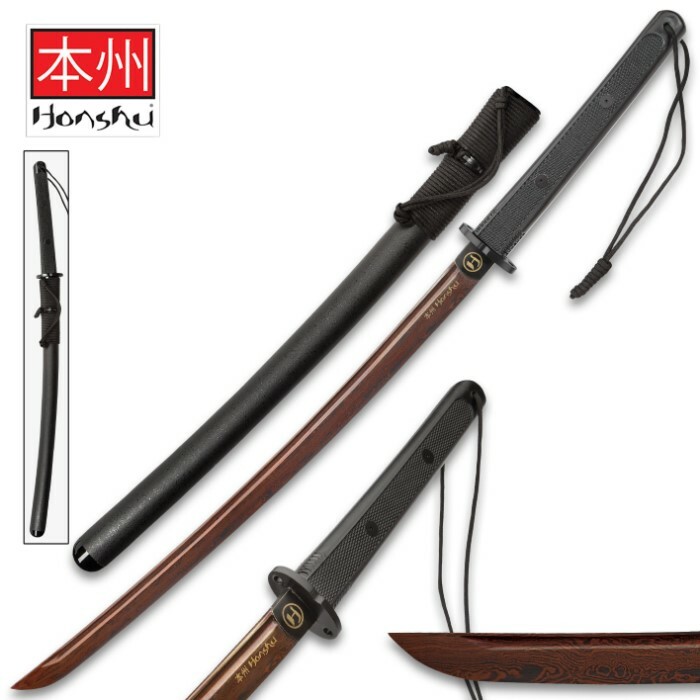 And like all Honshu swords, it flawlessly balances ancient and modern, traditional and innovative, beautiful and functional. 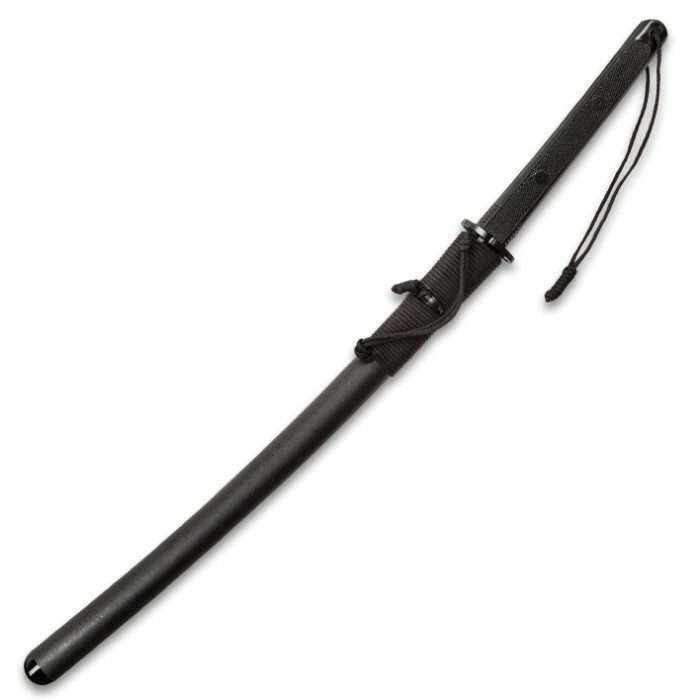 There’s no question – a Honshu is no ordinary sword. But, likewise, the Evenfall isn’t just any Honshu. This capable, eye-catching wakizashi is in a class all its own, boasting unparalleled style and feel, as well as rare appointments and exclusive materials – not least of which is the blade’s breathtaking black Damascus steel. Like the Evenfall itself, black Damascus stands apart and stands tall, casting a bewitching black shadow over ordinary steels that leaves them comparatively dim and underwhelming. Like its “original” Damascus counterpart, black Damascus steel is a raging sea of contrasting lines that form ripples, waves, ellipses and other spellbinding patterns. 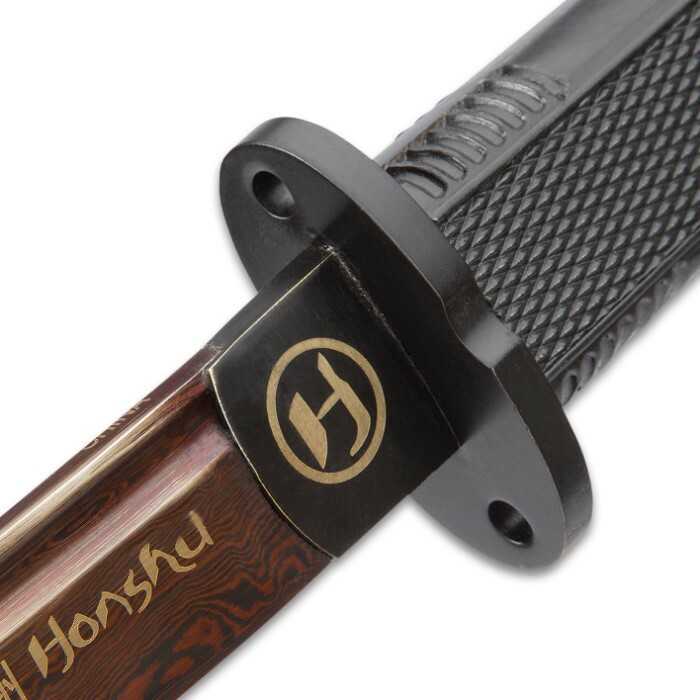 To achieve this remarkable figuring, Honshu's master swordsmiths painstakingly and repeatedly fire, fold and hammer weld two different high carbon steel varieties, yielding thousands of distinct layers. Once the metals are inseparably fused, an acid etching highlights the bold contrasts in the resulting layers. It's a slow, laborious process that can take hours, days, even weeks. The technique has changed little since Damascus steel's development in the Middle Ages – no automation, every step diligently performed by hand. This is a great handling blade. I have zero regrets buying this Wakizashi. Comes sharp, but not razor sharp. That was a easy fix. If your considering buying this blade. Buy it. It's worth the price. Thanks for another quality sword True Swords. I just received the sword today and I'm very happy with my purchase. Although the blade didn't come "razor" sharp as it says on the box it comes in, it did cut that same box in half with a one handed swing (which I thought was pretty cool). And also the black Damascus blade is beautiful. I got the back harness with this and it works great with the sword too. I can unsheath it with no problem at all. Putting it back in is also easy with practice. I was really looking forward for this product but it wasnt sharp and the sheath doesnt fit well.